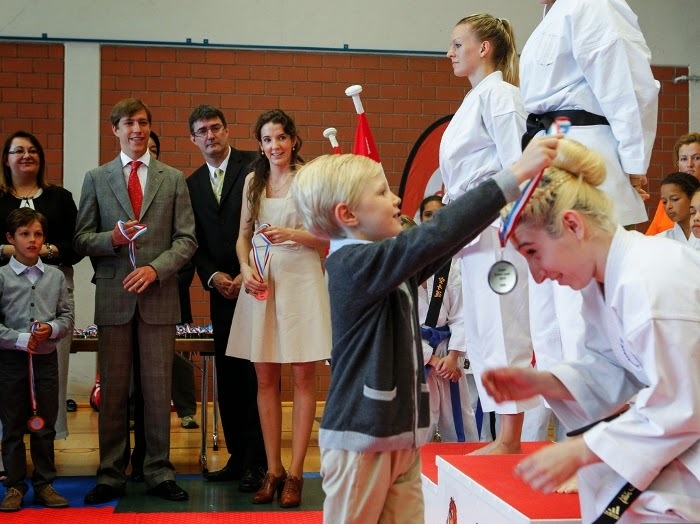 Yesterday, Prince Louis and Princess Tessy accompanied by their sons Prince Gabriel and Prince Noah attended the Coupe Prince Louis, a karate tournament named after the third son of the Grand Duke. Prince Louis has been the patron of the Martial Arts Association of Luxembourg for several years though (to the best of my knowledge) this is the first time he has actually attended the event. After watching several fights, the young family was on hand to hand out the medals to the children and teenagers participating in the competition. Prince Louis was also given an honorary black belt. Both Wort in German as well as Wort in English have pictures of the event.